The opening bank balance for the first statement mirrors the opening bank balance for the first day of the financial year. You can check this in Settings - Bank Accounts. Each month following will automatically take the prior month’s closing bank balance as its opening balance. This is automatically calculated as the sum of all bank transactions recorded in Cash Manager Focus regardless of whether they are coded or uncoded. This should reflect the actual closing balance for the month at the bank. This is automatically calculated as the sum of all bank transactions that have been coded in Cash Manager Focus. 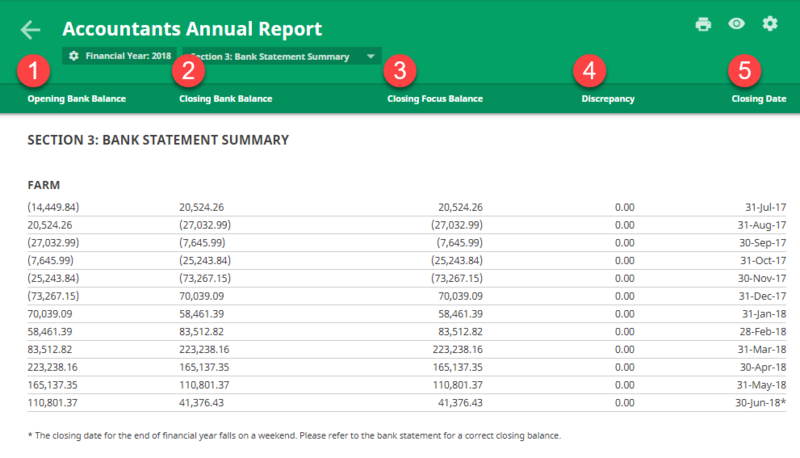 If the closing bank balance and the closing focus balance for each month don't match a discrepancy will appear. Discrepancies can be caused by uncoded transactions, duplicate or missing transactions, or transactions that have been deleted. The closing date is automatically captured by Cash Manager Focus as the last day of each month. If the last day of the financial year falls on a weekend you will see a warning to check the closing balance on the physical bank statement.